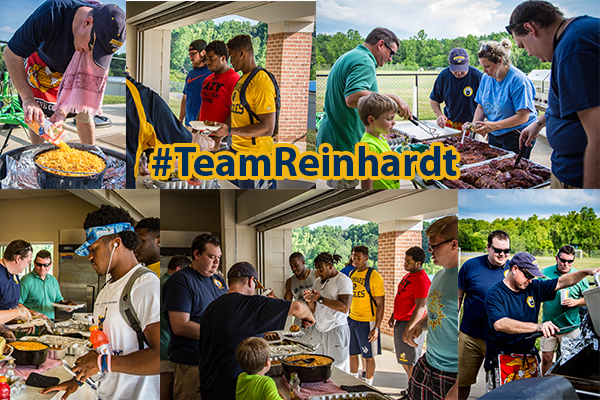 When their culinary services were needed, members of Reinhardt University’s Police Academy pulled out their aprons and fired up the grill. Police Academy Director Trey Drawdy, lead instructor Jeff Black and Academy graduate and current Bachelor of Criminal Justice student Marcus Lamb, of Waleska, served up a large, homemade spread of ribs, potato casserole, macaroni and cheese, green beans, cole slaw and bread to about 20 hungry football players. Almost 30 players are living on campus this summer helping out with work around campus. Head Football Coach Drew Cronic said the idea for the players to stay on campus, make a little money and work was the brainchild of David Leopard, vice president of finance and administration. The players eat in the dining hall while they are living on campus but on June 3, the Gordy had to close while there were no camps during the week. When Drawdy learned that the players would not have access to the dining hall that weekend, he brought his game day spread to the field house. “We fed about 19 players and a couple of coaches. We had so much food that many came back for seconds and some took plates home for the weekend,” Drawdy said. Since the Police Academy is not housed on the main campus, many do not know that the University has such a program. To help bridge that gap, Drawdy said he tailgates at every home game and invites anyone who wants to come. He said he likes to get the program members involved on campus. Cronic said while he heard the spread was great (he is rehabbing a torn Achilles and was not able to make it) and received feedback from the players and coaches about Drawdy’s culinary skills, he felt this was a good opportunity for the players to learn about the Police Academy at Reinhardt should they be interested in that field.